Temporary Snow Birds | Does This Font Make Me Look Fat? Both Laura and I were able to spend some time in warmer climes recently. My husband and I were in Key West for two warm weeks, and Laura and her husband happened to be there as well for one of the weekends before they headed off for a week in Cancun. 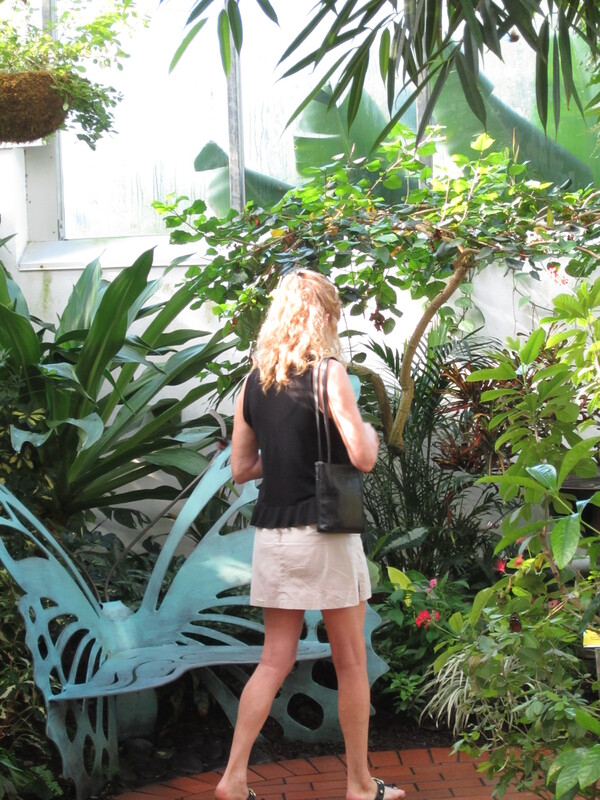 I always try to go to the Butterfly Conservatory while I’m in Key West and this time Laura joined me. Best time to go is early in the morning when the butterflies are most active, and before the tourists arrive in droves. Laura kept walking away when I tried to take her picture, so she’ll have to cope with a rear view. I had a couple of goals for Key West (in addition to having warm feet). One was to walk as much as I could and see if I could do some 10K step days. I actually managed that 7 times in the two week period and most days got at least 8K steps in. I usually start out about 7 a.m. before the sun gets too high and there aren’t lots of people on the streets. 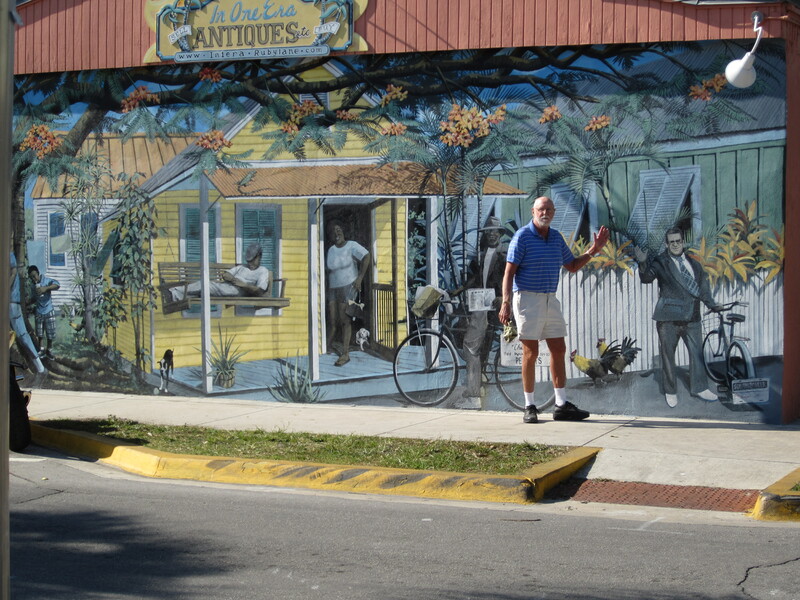 I love walking in Key West because there is so much to look at. I vary my walk every day and don’t run out of new routes in the two weeks we are there. Below is an amazing mural on the side of a building. My husband is the one with his feet on the sidewalk. My other goal was to work on book three of my Caribbean novel series. I wrote the second ten years ago and never got back to the third book. The first thing I had to do was reread the first two books: A Dream Across Time and A Circle of Dreams. I suppose it’s not really surprising that I had lost some of the threads of those stories that follow several Caribbean families. Then I had to figure out what the story arc for book three is. I’m still working on that, but am closer than I was. The love interest for one of the characters showed up in Key West and that was a breakthrough. It is incredibly frustrating how the creative process marinates in my brain and shows up when it is ready, not when I demand. But I love how it is there, all the time, just at the edge of my consciousness. In the meantime I keep writing dialogue or description or a scene even if I don’t know where (or if) it will go. This morning in the shower I realized how I think I want to start this book, so I dried off, got dressed, and sat down to write for ten minutes before I headed off through the frigid air to yoga class. Update on Key West weather: It was in the 70’s and 80’s when we were there the last week in January and the first week in February. Today when I looked on Wunderground the projections were for highs in the 50’s and 60’s. That is cold for Key West! This entry was posted in Laura Ambler, Mala Burt, Personal, Uncategorized, Writing and tagged Key West Butterfly Conservatory, Key West Florida, Laura Ambler, Mala Burt, writing, writing goals by Mala Burt. Bookmark the permalink.